Tomatillo Avocado Salsa Verde Recipe – Fresh salsa verde blended with ripe avocados for a silky texture with a punch of heat. The BEST salsa verde we’ve ever made! 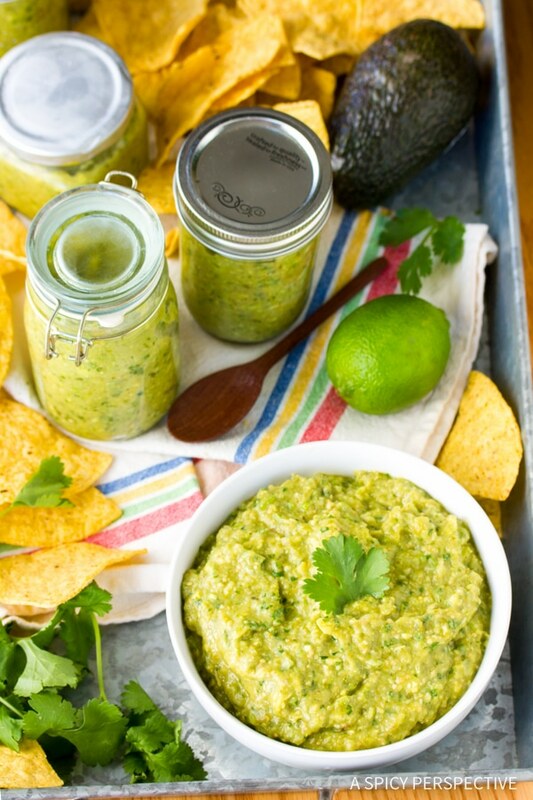 This Tomatillo Avocado Salsa Verde Recipe is freshly picked straight out of the ASP garden! So when I say garden, I really mean flowerbeds. For years I’ve pretended to have a green thumb, digging in the dirt, researching regional plants, perusing plant nurseries. Truthfully, I have no idea what I’m doing. I plant things in the wrong places, prune too much or too little, and forget to water. Giving up mid-season, I always determine next year’s garden will be a masterpiece. This year I decided since my “landscaping” always looks wild and unruly, why not plant some produce in it. It couldn’t possibly make it look any worse. And you know what? It actually looks pretty good with the blooming squash blossoms, variegated heirloom tomatoes, Japanese eggplants, and ethereal tomatillos scattered about. 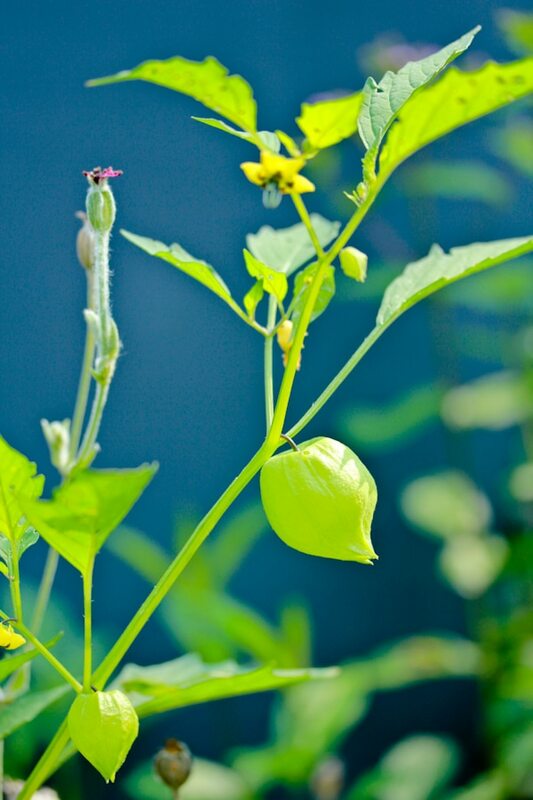 Tomatillos are such unique looking plants, with hearty tomato-like stalks, and little paper lanterns hanging everywhere. The tomatillos start out like tiny bulbs inside lime green lanterns. Then as they grow, they fill in the paper wrappings until they are tight. Full lanterns mean ripe tomatillos. And they are very hard to kill easy to grow! After sticking them in the ground with very little thought, they have taken off. Tomatillos offer a vibrant tart flavor, almost like a citrusy apple, and are much firmer than tomatoes. What can you do with tomatillos? Eat them raw with a sprinkle of salt and sugar. Add them to cold or hot soups. Fry them like green tomatoes. Tomatillo Salsa is delightful in a raw or cooked state, but I prefer mine somewhere in between. Roasting the tomatillos for a short time provides a lovely balance in flavor, leaving the raw edgy appeal, but also providing a certain charred quality. Tomatillo Salsa Verde is a true family favorite that is lighter and perkier than most tomato salsas. The extra acidity holds up well against spicy heat. Today’s Tomatillo Avocado Salsa Verde recipe is unique because it contains avocados as well as tomatillos. The creamy consistency of the avocados combined with the zippy tomatillos is sublimely addictive. In fact, it’s so addictive that I’ve developed my Tomatillo Avocado Salsa to make FOUR QUARTS in one batch! Of course you could half it, but once your friends and neighbors taste this, they’ll be knocking at your doors holding bags of tortilla chips. Plus, you can freeze this salsa verde recipe for later. Although it’s not a great idea to “can” anything with avocados, this recipe freezes very well. So long after your tomatillos have withered away, you can enjoy roasted tomatillo salsa and wish for warm weather again. 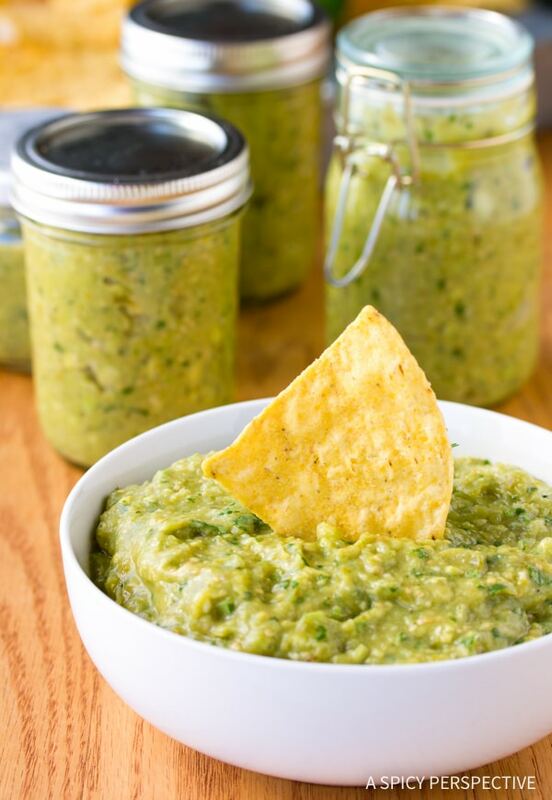 Amazing Tomatillo Avocado Salsa Verde Recipe! 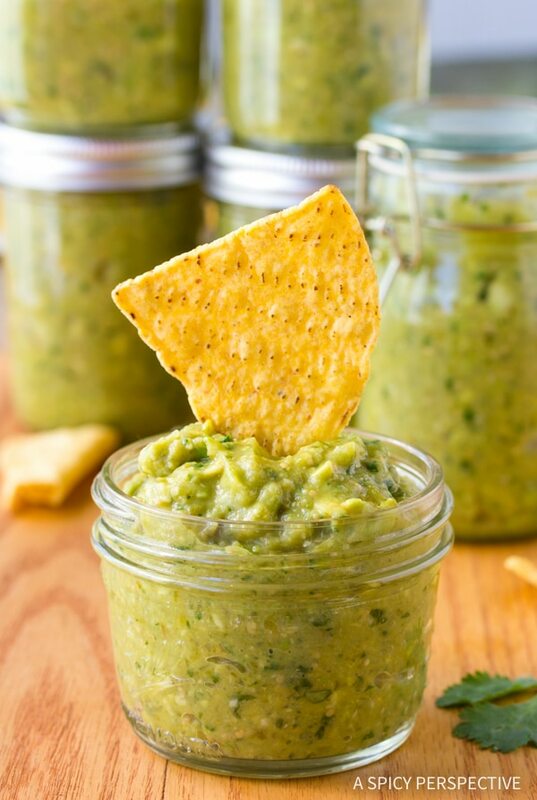 Fresh salsa verde blended with ripe avocados for a silky texture with a punch of heat. The BEST salsa verde we've ever made! Preheat the oven to 450 degrees F. Peel and chop the onions into quarters. Place the tomatillos, onions, garlic, and jalapeños on a rimmed baking sheet. Drizzle with oil. Roast in the oven for 15 minutes—until the exteriors are blistered but the insides are still slightly raw. Meanwhile, half the avocados, remove the seeds, and scoop out the flesh. Cut the jalapeños in half and scrape out the seeds. Discard the seeds. Place half of the tomatillos, onions, jalapeños, and garlic in a food processor. Pulse until mostly smooth. Add half of the cumin, salt, cilantro and avocado. Pulse until the avocado is pureed into the mixture. Taste for salt. Repeat with the remaining ingredients. If you desire an extra tangy quality, add a bit of lime juice at the end. Does the Creamy Avacado, Salsa Verde turn brown if we don’t eat it fresh ? What do you suggest for storage and for how long ? It does brown over time, but the tomatillos are very acidic, so they slow down oxidation quite a bit. It doesn’t brown nearly as fast as guacamole. Freezing: Did you freeze the mixture in Ball/Mason jars and how long can you freeze for? Thank you. This looks so delicious. I will be making it for my family. Is there a way to can and put on the shelf. My freezer stays ful. I’m definitely an avocado girl, and it looks like you put them to good use! Looks absolutely delish for dipping!! 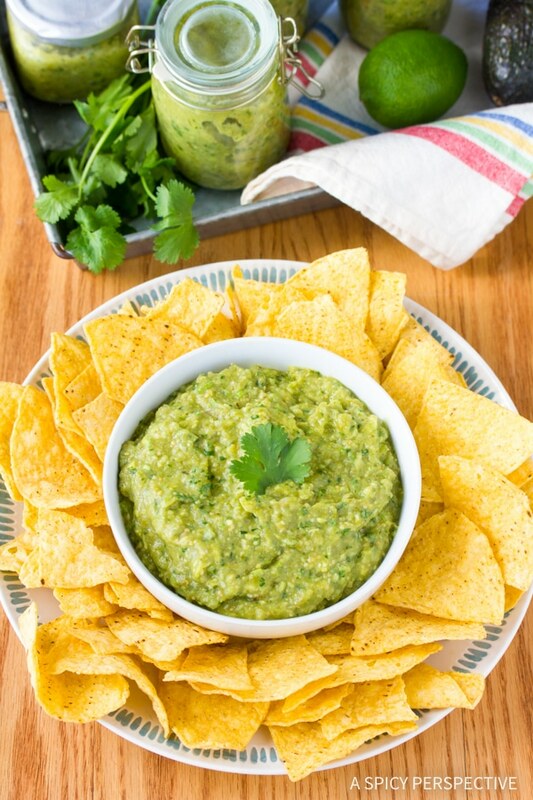 I love the combination of avocados and salsa verde! Beautifully done. I made this tonight and it is absolutely amazing! If you like lime, I definitely recommend using it, as it gave the salsa a zing. Just made this and it’s a winner. I hope it is as delicious out of the freezer! 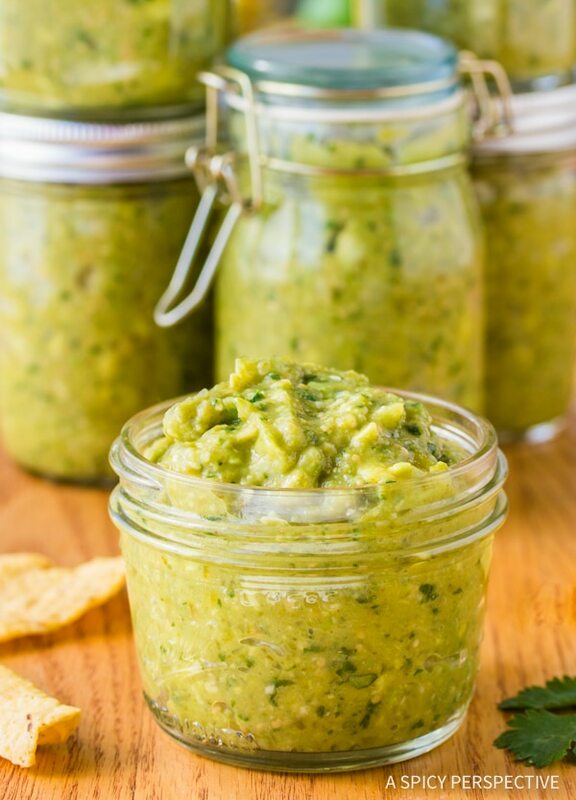 Deliciosa salsa verde con aguacate! Auténtica! Felicidades por tu blog! Fantastic!!! Nice and spicy especially the next day. Sounds amazing but would like to know the CANNING process. Didn’t see that anywhere. Waterbath or pressure canning? Hi! 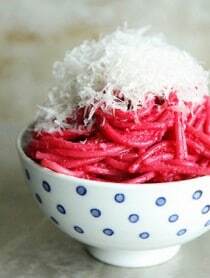 I just got a food processor and cannot wait to try this recipe…. it looks delicious!! Where did you get those adorable little jars you store the salsa in?! I’m obsessed with them!! Thanks! OMGosh, Me and my sister made this last night and it is soooo awesome. Love the flavor of the cilantro. We tried with lime and without and both ways are incredible. Made exactly like the recipe says. The only thing is we only got 4 pints out of the recipe. I believe we may have cooked the tomatillos too long. Still an amazing recipe and will be making quite often. My sisters response was “Restuarant Quality” We loved it!!!! Hi Karen, Thanks for coming back to comment. I’m SO glad you liked it!! I made this recipe tonight and it is amazing! I didn’t roast anything; I just threw it all in the processor and away we went! It’s super good made raw. Thanks so much for sharing! This IS AMAZING! I even forgot the garlic and still Amazing!! I halved the recipe because frankly my grocery store did not carry enough tomatillos! But I used all four jalapeños and it was just the right heat! How long will this store in the refrigerator? I live in England and tomatilloes are virtually unknown here. However, I grew them this year and they have been prolific! I have made your chicken stew (delicious!) and this salsa Verde. I felt sure I would be freezing lots, but it was so wonderful it all got eaten very quickly. My brother and Mum both took a pot home and said how professional it tasted. Thanks so much for the recipe. It’s tastier and healthier than shop bought versions and such a great use of the enormous tomatillo crop I’ve produced. I feel very smug! Thanks, Elise. I made this today and i just had to tell you that it is EXCEPTIONAL. I am off to pick up enough tomatillos to make 3 or 4 more batches! Yes! I made it Saturday and ate it until it was gone on Thursday. For a party, it will be gone that day though! That is fantastic! I just served it over shrimp gilled with Mexican spice mixture & topped w/sour cream. I am moaning in ecstasy! I don’t understand why anyone bothers to go out to eat when you can whip up something this good fairly simply. just got a jar of the avocado salsa. is it suppose to be refrigerated or because it is canned it will be fine in the cabinet and refrigerate after opening? 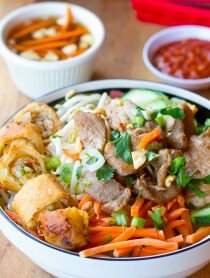 Love your food blog with exciting different recipes. Hope it’s okay but I pinned your Salsa Verde Recipe on my Pinterest Board, under Christmas delicious food. Will be making this for Christmas. Love your fun for food. Shared your Salsa Verde Recipe on my Pinterest Board. I admire anyone who cans like this. It’s so impressive! I can see why this salsa is so addicting! A friend made this last night for our book club. It is the best salsa I’ve ever eaten! Thank you for sharing. I would like to confirm that, Michelle: This is the best salsa verde I have ever eaten. A Guatemalan friend made a version of this recently, which was formerly the best I’d ever eaten (it did contain avocados). The only change I made was to use two jalapenos and two habaneros, which gave it just the right amount of heat for a medium spicy. Many thanks for this recipe. I have spent quite a long while searching for the right one, and this is it! Thanks Michelle and Gina, you girls made my day! Just an important correction: I used Serrano chiles, not Habaneros. I will be making this often, and I do believe it is very authentic. Another fantastic recipe using avocados. A win for everyone!!! Can’t wait to try this! Thank you for sharing. This salsa was amazing. This is the first time I grew tomatillos. They grew like crazy. Didn’t know how many ways you can use tomatillos. I live in high desert. I want to make this, but just have one question. This makes 4 pints. How do you store the extra? Do you freeze it or refrigerate it? What an original version of salsa verde! I’d love to see it linked up in our avocado link-up/giveaway that Kristen & I are hosting right now. Could this be canned if you left out the avocado? I only have a water bath canner and it seems the avocado would be the only thing that I would need to leave out to can it safety. Thanks! Made this today and its excellent. First, I love your site. I have never seen a tomatillo, so was wondering about subbing green tomatoes. I would love to grow them since we grow tomatoes if I can find the seeds. the recipe looks yummy. To sub tomatillos you can you a jar of green salsa Verde. ( it’s got all the above ingredients minus the avocado’s. So when you are in a hurry get a jar of La Cosenta green salsa ( my fav) an avocado I like to add a little extra garlic, jalapeño, salt and cilantro! YUM quick and easy! I do plan to try it from scratch on day too! I saw this on pintrest and knew i had to make it and i did today. It is wonderful i ate so much but i bet the stuff cooling in my fridge is even better. Thanks. How long do you think it will last in the fridge? Just took my first jar out of the freezer for a Halloween snack. Yummy! Thawed perfect. Thanks. I just made this today. My husband said it was yummy and I loved it. It ‘s a guacamole dip and salsa all in one. I grew tomatillos many years back. They have an interesting plant. I love those papery husks. They are just wonderful. The salsa sounds wonderful. Got to try that. Thanks for sharing. I just made this and it is fantastic. It’s like if you puréed a Chipotle burrito and ate it. If I were on death row, I would ask for this to be part of my last meal. I am making this right now – everything is in the oven. I can not wait to try it!!! I’m afraid I might eat it all myself! This year I have plenty of plants going and lots of ideas but I also started pineapple tomatillos and I have NO idea what to do with them, any suggestions? Wish I could have one of those little green jars, they look so good! Hard to kill, I mean, easy to grow sounds exactly like my kind of plant. Thanks for the great ideas, this is my second year growing tomatillos and last year I gave a lot away because I did not know what to do with them. This year I have plenty of plants going and lots of ideas but I also started pineapple tomatillos and I have NO idea what to do with them, any suggestions? Love the fusion of avo and tomatillos! This is fantastic. Love the mash up with the avocado and the green lanterns :) Buzzed! not sure if there’s any science behind this, but I’ve found that (1) using a 50-50 tomatillo to tomato ratio gives the perfect sweet/tart flavor for our salsa, and (2) cutting them in half before roasting lets some steam escape, resulting in a less soupy, chunkier salsa. cheers! You’re right, tomatillos are really interesting looking and make for a great photography subject. And I never knew they were so easy to grow, good to know! You’ll have to send me a jar… you photography is really looking stellar.. well done you! LOVE it, I am a huge fan of tomatillos and ground cherries. I’ve never had luck growing tomatillos, so kudos to you for that alone! The salsa looks great too, something new to do with avocados. Thanks! Wow! This looks really amazing. I’m blown away that you grew your own tomatillos!!!! Beautiful. I love salsa verde with enchiladas! Love this. And love the idea of jarring it for a rainy day. I have so many hot peppers right now that I’m trying to decide what to do with…. maybe a salsa is in order! 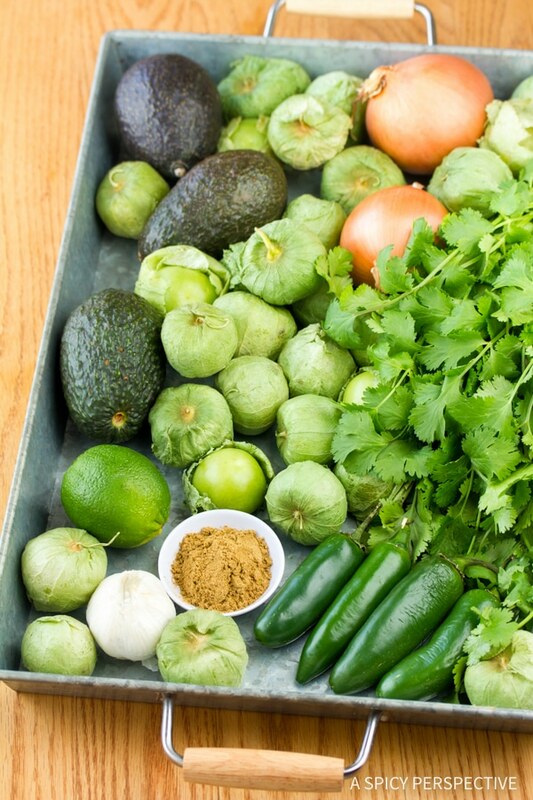 I don’t think I ever had tomatillos before….would really love to try! The salsa verde sounds and looks tempting! So cool that you grew your own tomatillos! I took a break this year and joined a CSA – the wildlife wore me down last summer. Love the creaminess that the avocado must bring to this tomatillo salsa. As alway I love your photos! Superb! I never thought about growing tomatillos, I will have to try them next year. My garden is full of grass and my yard is just dirt, that should tell you something about my skills. Oh – I LOVE this! I read your post aloud to my husband about planting vegetables in your landscaping. I am horrible at landscaping and gave up years ago…..but veggies in with everything else? Awesome! I can just imagine the wonderful flavors of that salsa with all of those roasted veggies. So beautiful! Never would have thought to grow tomatillos! I grow tomatoes and peppers, but not them! What a great recipe! One of the best parts of Mexican restaurants is the salsa verde! Hah I love the garden stories- I have similar issues! This recipe looks amazing… I never considered roasting ingredients for my salsa. I will have to try that! Looks yummy for my tummy. I could can it without the avacado though couldn’t I and then when I find ripe avacadoes all I have to do is add the salsa? Okay, remind me next year that I need to grow tomatillos! Because we love them and it never occurred to me to grow my own. Fab salsa, especially with the avocado in there. Thank you for sharing about tomatillos and how easy they are to grow. I’m adding them to a list of produce I would like to try for next year…I need produce that’s easy as I’m terrible w/my outside & inside plants. I struggle for a green thumb! I love tomatillos! This summer I attempted growing some of my own, but the green thumb didn’t seem to take effect. :D It’s so much fun to live vicariously through your harvest, though. Not to mention, avocados + tomatillos = yum!! ooh, this recipe looks delish. thanks, Spicy! AH! That picture of your garden is GORGEOUS. What kind of camera do you use?/! And I thought I was the only one not tending to a garden this summer! I too plant herbs and such here and there, but nothing full blown! Wonderful combination of flavors in this salsa and I like that it’s slightly roasted. 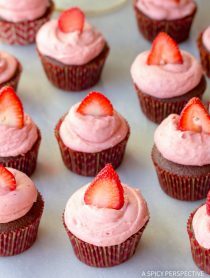 I think I’ll make the full recipe and share the love with all my friends! Avocado in salsa verde…OH MY YUM!! This sounds terrific! thank you for the great info, I have eaten tons of tomatiollos , but never tried to grow them!! I make salsa verde often, but never thought of the addition of avocado and cilantro. It almose sounds like a pico de gallo with tomatillos rather than tomatoes, which has been more throughly blended, of course. This is a condiment that I”d like to try. How delicious this looks! If only we had tomatillos here in France…! Was it easy to grow them? I am not a great “plant-mama” either. Never thought of growing tomatillos. You seem to be doing OK! Great recipe! Perfect for summer parties! That looks so good. Wonderful pictures as always! This looks so tempting. Your pictures are to die for! This sounds terrific! I never knew how they grew – very interesting and informative as always! Beautiful photos too. Wish I lived next door – I would bring the chips! This looks fantastic. Great recipe.